Examining tactical and substantive issues inherent in a homicide arrest and trial, Crimes of Violence: Homicide and Assault leads you through all the difficult steps, from pretrial investigatory stages to the actual courtroom confrontation. This title explores nonobvious types of death and identifies elements for determining death. The authors provide trial strategies and tactics for jury selection, opening statements, plea negotiations, and illegally obtained evidence and confessions. 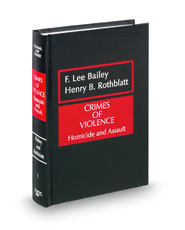 The volumes review specific homicide crimes, as well as assault, battery, and kidnapping crimes. They include procedural checklists, search methods, and specifics explaining how to cast and evaluate footprint molds, blood samples, autopsy findings, and firearms.